You know that ‘80s Bond movie where the Aston Martin has skis, the Bond girl plays the cello, and the Taliban are good guys? I love that one! What was it called? The Living Daylights! Here’s why it’s the 10th best Bond movie ever made. The Living Daylights ends up being a very unique Bond film. It was released in 1987, and up until then audiences had been enjoying the eye-brow raising, sly-witted, out of this world (literally) adventures of Roger Moore over seven Bond films spanning 12 years. 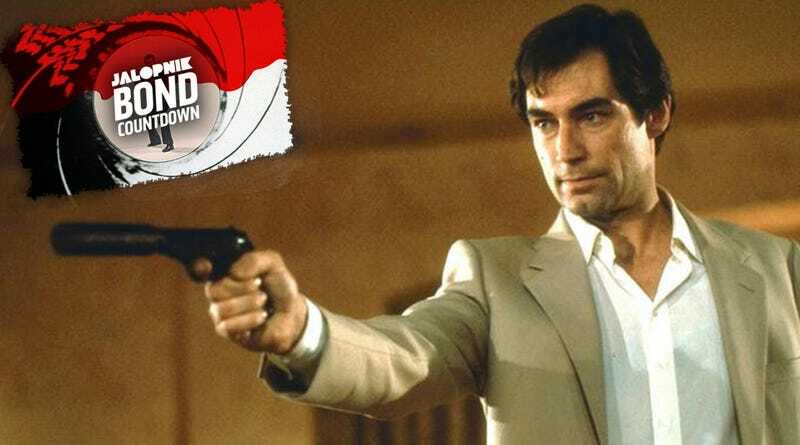 Timothy Dalton, the new actor in the role of James Bond, had originally been offered a chance between Sean Connery and Roger Moore, but still being in his early 20s in 1968, he felt he was too young to play Bond. Oddly enough, after Moore bowed out almost 20 years later, Dalton wasn’t the first choice. Pierce Brosnan had the gig in the bag, but at the last possible moment his contract for the hit television program Remington Steele was extended by the television network, and he was forced to turn down Bond (spoiler alert: he got it eventually). In comes Timothy Dalton. The Living Daylights doesn’t try to overplay the introduction of a new Bond. Its pre-titles-sequence, or the part before the dancing naked ladies and music, just shows Bond during a training exercise with his fellow MI6 agents. The exercise turns fatal when a Russian assassin turns up and kills the other agents, leaving behind the message Smiert Spionam - Russian for death to spies. Bond takes care of him by driving a Land Rover full of explosives (because what else would a Land Rover be carrying on a British island base) off a cliff and this motivates the start of the plot. The rest of the film focuses on what initially appears to be a defecting KGB agent, General Georgi Koskov, who is actually a rogue Russian looking to pitch the British against the Russians to distract them away from his corrupt arrangement of a huge arms deal - hence the assassin sent to kill Bond and Co. on their training exercise. Bond steals Koskov’s oblivious cello playing girlfriend and chases him through Czechoslovakia, Austria and Afghanistan. Bond is after a Russian, who is running from the Russians, who are chasing Bond. That kind of thing happens to him a lot. The Bond car is a Q-Branch modified Aston Martin V8 Vantage, with a special Volante (convertible) edition also used in the film. It sports rocket launchers with a heads-up-display launchings system, laser-beam hub caps, bulletproof glass, studded tires, and deploy-able skis, which really come in handy when the Aston’s tires are shot out while drifting across an iced-over lake. Q always knew what to expect, eh? All of that is put to good use in a decent chase in which the KGB have sent an Armored Personnel Carrier to capture a girl who plays the cello, but Bond and her get away and the car is left behind to self-destruct. This movie works so well as a Bond film because it is the last time the Russian government acts as a bona-fide “enemy” to Bond. As the world embraced “detente”, or stalemate of the Cold War over the last years of the Soviet Union, so did Bond. The Living Daylights was a rather refreshing last hurrah for the Reds to play the baddies. Yes, technically Bond is after a defector, but the bulk of the finale of the film takes place on a Russian airbase in Afghanistan. The Bond girl in this film is the cellist Kara Milovy, the girlfriend of the Russian defector and Bond’s eventual love interest. She gets set up by her man and eventually helps Bond after realizing her cello was bought with the money from the corrupt arms deal. The cello is a far bigger plot point than you might initially imagine, a deals a decent amount of humor into the story. The action is great, and this film really takes advantage of the traditional Bond-film formula. Bond and Kara end up in the hands of the Russians at an airbase in Afghanistan. They escape along with a leader in the Mujaheddin, and team up to fight the defector Bond has been chasing and all his opium-smuggling, weapon trafficking Russian buddies. Remember... this is 1987, so Russia was occupying Afghanistan and the Taliban were the good guys. Timothy Dalton’s edgier Bond works out alright, if coming across slightly less charismatic and more Shakespearean than Roger Moore, but the filmmakers managed to adapt the storyline to this new approach very effectively. I’ll give Dalton a pass as it was his first film and they were all taking it extremely safe, and he definitely firmly established himself as Bond in his only follow up, License To Kill. There is one key piece of dialogue that stands out: “If he fires me, I’ll thank him for it.” Did James Bond really just say this about his boss, M? Up until this point in the franchise, and in the majority of the original novels, Bond only has the utmost respect for his superior. Most fans write this line off as a mixed-interpretation by Dalton and the crew from Bond’s more cynical attitude in the books, but it doesn’t really fit. The soundtrack for The Living Daylights happens to be last Bond film scored by the late and great composer John Barry, who defined the Bondian sound and makes his only cameo appearance in the series as the conductor at the end of the film during Kara’s cello solo. Unfortunately it is nowhere near his strongest sound, but it blends the classic Bond sound with the synth of the 80’s better than anyone else could have. Bond teaming up with a group who are now considered terrorists is also extremely unfortunate, but appropriate for the time. There is also an odd scene where Bond unintentionally pulls a gun on a kid and his mom at the carnival, which is extremely uncomfortable and awkward. This film is the 10th best Bond film out of the 23 because while it features the first of Timothy Dalton and the last of the legitimate Russian bad guys for the series, but the pacing feels just slightly off and ultimately it lacks the charismatic punch of the others on this list. It seems to play it a little too safe for its own good. There is plenty to remember in this film, but it can’t shake the feeling that there is some sort of angle missing, causing it to be overlooked far too often for not standing out. This is the James Bond film you watch when you’re craving more Timothy Dalton awesomeness after watching Hot Fuzz. We still get a formulaic Bond film, decent villains, an appropriate blend of humor and cynicism, and a simple, fun time. There is plenty to remember in this film, and a lot of big themes that keep it up with the best of them, but it can’t shake the feeling that there is something missing, causing it to be overlooked far too often. And so it stands as a strong example of a basic good Bond movie on the bottom of our list of the top ten James Bond films. Tune in next week to see number nine.